A little while ago I had an interesting conversation with Frank Thomas' son Ted. He brought something up that I had given some thought to for a while. Ted pointed out that his father's character animation seldom included what today is referred to as "golden poses", "super poses" or "storytelling poses". The kind of all important drawings in a scene that by themselves define the character's business or thoughts. I heard someone mentioning those terms years ago at Disney...from an animation intern, who most likely picked them up at his animation school. Ted and I both agree that Milt Kahl's animation showcases exactly that: one golden pose after another, timed in a way that the audience registers them very clearly. When I study Frank's animation, most of the time I can't find that golden pose. 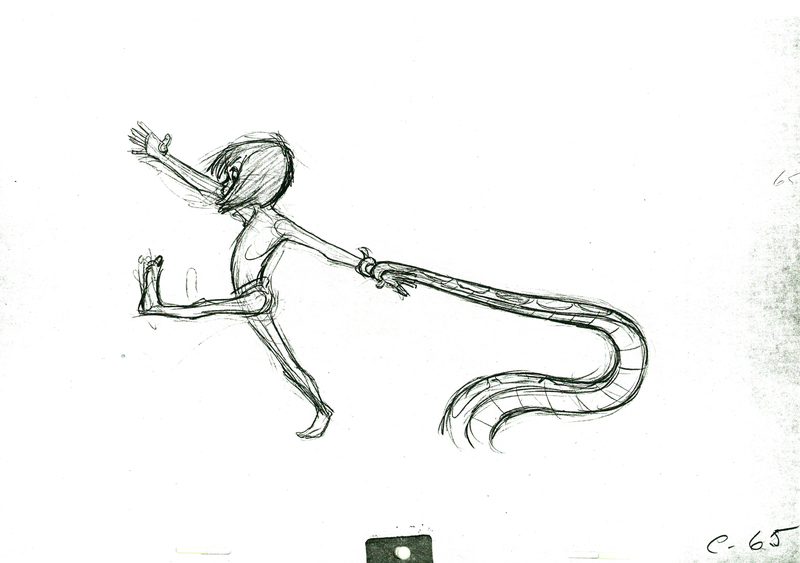 It is usually a series of drawings that stand in for the ONE all important pose. 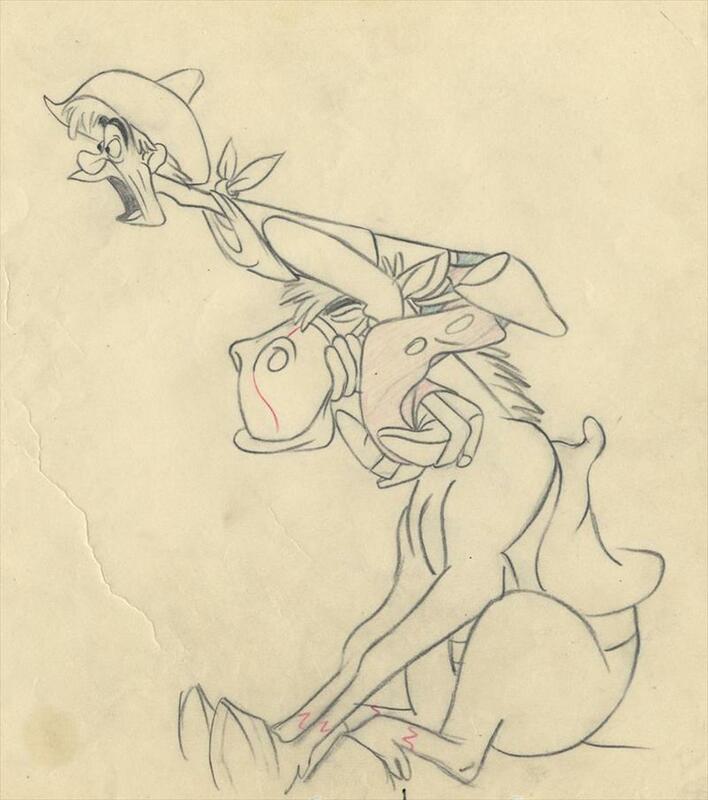 Look at these two key drawings from Pecos Bill by Milt. They are practically illustrations that give you all the information about the scenes in one drawing. Slue Foot Sue is in control as she embraces Pecos bill for a kiss. Phenomenal design, staging etc. The same goes for the next scene. Pecos reacts to seeing Slue Foot Sue for the first time. Look at the directional force. 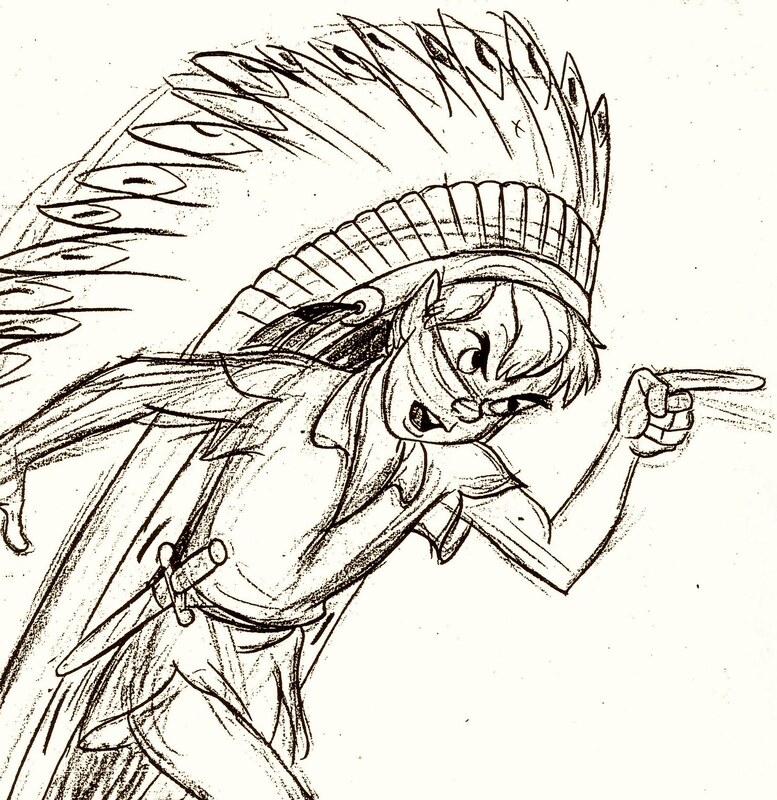 Pecos becomes one forward pointing arrow. 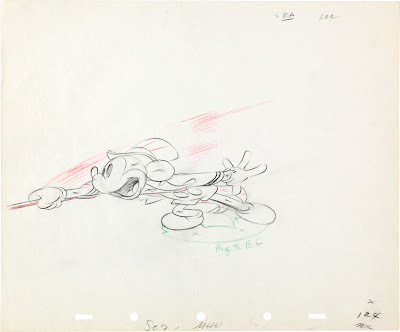 Milt's first animation from Mickey's Circus already shows extraordinary dynamic staging. 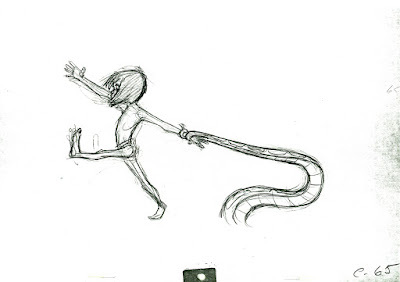 I'd call this one of his early super poses. 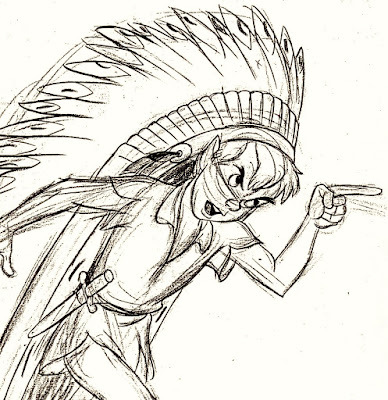 Peter Pan is warning Wendy and the Lost Boys that once you leave Never Land, you can not return. Everything is perfect here. His lowered head shows that he is serious in what he is saying, as he points one finger at the group. What great clarity! I would say that Edgar's poses 1, 3 and 4 qualify as super poses. First he anticipates throwing a kiss, then he gleefully hops up and down because of some good news and then the change in attitude as he overhears that the news might not be as good after all. Ridiculously strong drawings give away Edgar's emotional state. Great clarity again in this action/reaction situation. One vulture pushes the other three down a branch. His straightened out wing is in stark contrast to the wings of the other two, who try to maintain balance. One drawing says it all. King Louie teases Mowgli as he dances to the Jungle rhythm. 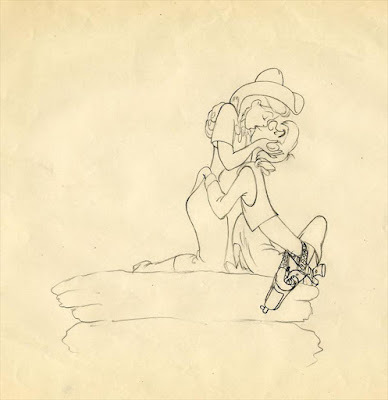 Every key drawing in the scene is beautifully designed within a clear silhouette. Let's get to Frank Thomas. This is one of his drawings for a scene in which Mowgli is reacting to Baloo's loud roaring. He is practically up against a storm breeze. No superior design here, and perhaps a little out of proportions. 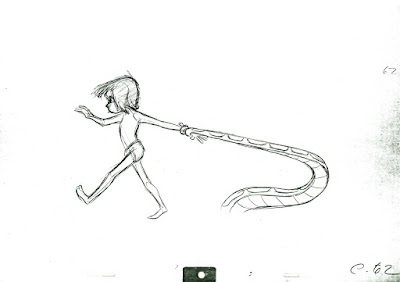 BUT seen in motion this piece of animation looks incredible because Mowgli's motion feels utterly real and convincing. Every step has proper weight. You really forget you are looking at drawings and accept this kid as a real person. 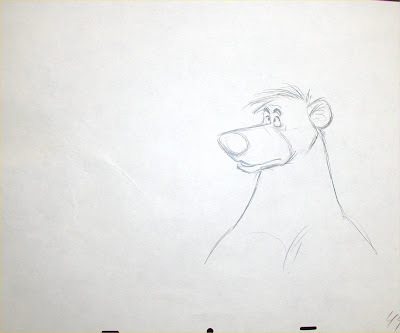 An almost dull close up drawing of Baloo, as he argues with Bagheera. 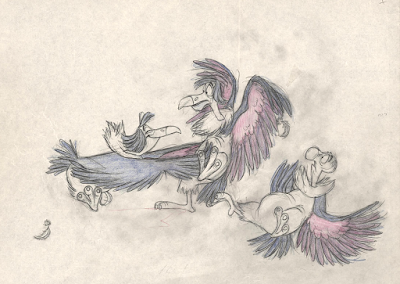 Again, in motion this scene showcases the kind of life very few animators ever achieve. A few drawings by Frank from a scene where Mowgli is reacting to Kaa's grip on his arm. You couldn't' pick any golden drawings out of the whole scene. Somehow they all matter the same and were drawn with the conviction that the movement supersedes any single carefully designed pose. 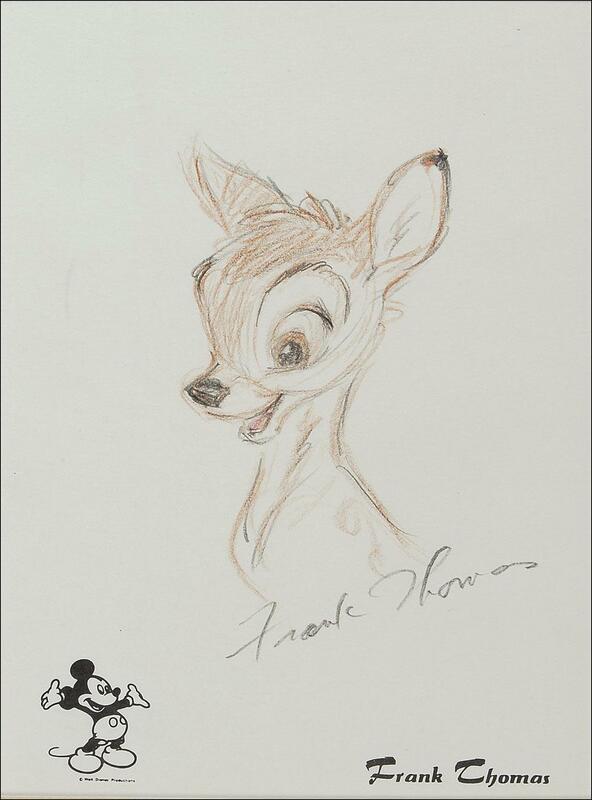 Frank often declared that he had to fight to make his drawings look good, and looked at the draughtsmanship of colleagues like Milt and Marc Davis with envy. 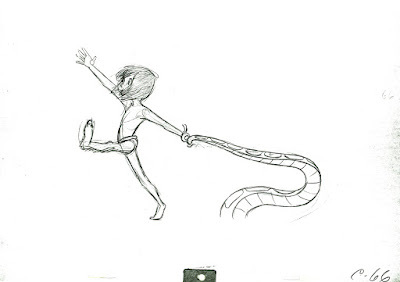 But he also felt that as far as personality and acting he dug deeper than other animators. I love this little sketch of Bambi Frank drew for a fan decades after the film's release. 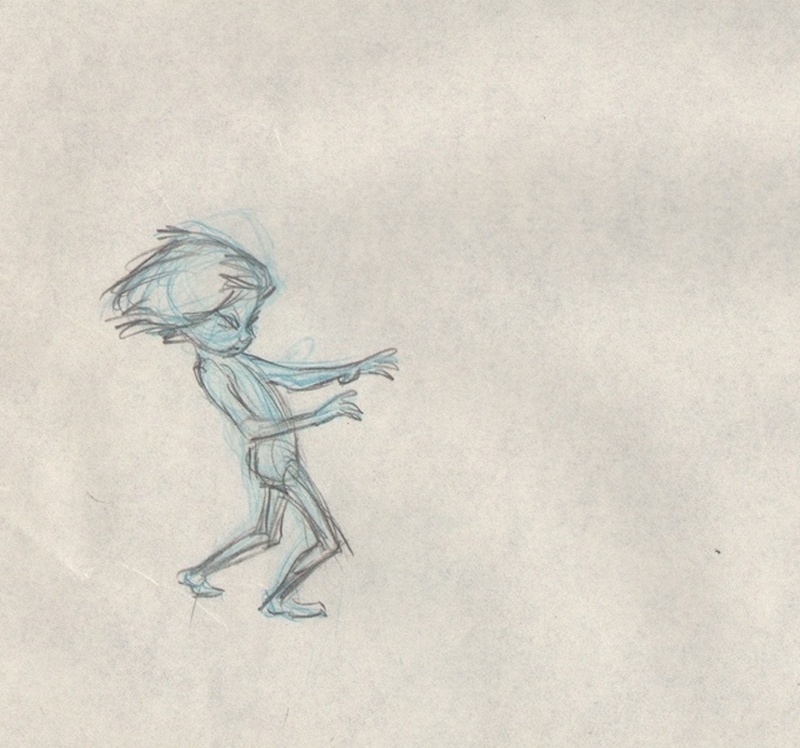 There is a soul behind those rough lines, and isn't that the whole thing about animation? Giving your characters a soul? I find a compelling part of Frank's method and thinking was that he was not necessarily opposed to golden poses, but he felt that they must be an integrated part of the scene and be supportive of the overall idea of the scene. I think that's one of the reasons he thumbnailed scenes so extensively, until he felt comfortable and confident with the business. In some ways I think Frank's self-proclaimed struggles with drawing were not as much draughtsmanship-related as they were feeling "right" in his gut... and he felt it when a series of drawings worked together. As such, he'd throw out a "good" drawing if it didn't support his overall goal for the scene. 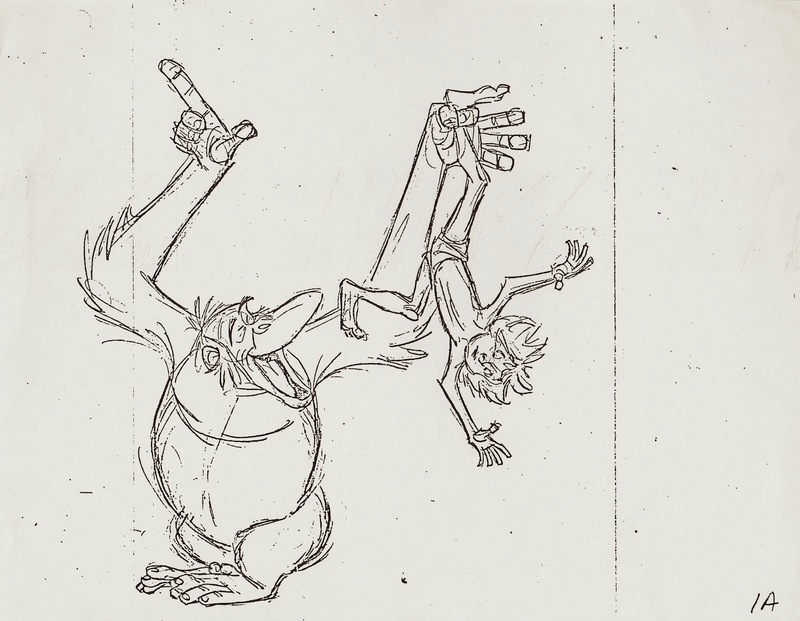 In contrast, Milt argued with him that you can always use a "good" drawing, and when you're lucky enough to get one, that should be the tent pole for the rest of the scene, even if it meant retooling the scene to build in and out of that pose. Frank, of course, differed, feeling that clarity of design was not always the same as clarity of character. I think part of Walt's genius was getting their push and pull collaborating together, because when I see Milt's beautiful work I always know what I'm watching, and with Frank's I always know who I am watching.